"These things are written so that you may believe that Jesus is the Messiah, the Son of God, and that by believing you may have life in his name." This is how the apostle John describes his purpose in telling the story of Jesus, first through his public ministry, then through private instruction of his followers. 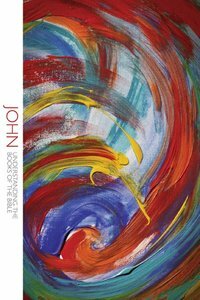 This unique guide takes readers through the gospel of John as a whole and then helps them engage and understand each of its individual sections. The 26-lesson format is ideally presented for group or individual studies and will evoke deep conversation and personal growth through a whole new way of learning from and engaging God's Word. The Understanding the Books of the Bible study series helps readers understand the biblical story by not only talking about what the authors wrote, but also how they wrote. Quite often, recognizing whether a passage is poetry, proverb, or history and discerning how the author built his book will unlock its meaning for today's reader.^^This is how the apostle John describes his purpose in telling the story of Jesus, first through his public ministry, then through private instruction of his followers. This unique guide takes readers through the gospel of John as a whole and then helps them engage and understand each of its individual sections. The 26-lesson format is ideally presented for group or individual studies and will evoke deep conversation and personal growth through a whole new way of learning from and engaging God's Word.^^The Understanding the Books of the Bible study series helps readers understand the biblical story by not only talking about what the authors wrote, but also how they wrote. Quite often, recognizing whether a passage is poetry, proverb, or history and discerning how the author built his book will unlock its meaning for today's reader. About "John (Understanding The Books Of The Bible Series)"
Rev. Dr. Christopher Smith (Ph.D., Boston College and Andover Newton Theological School) is Pastor of the University Baptist Church of East Lansing, Michigan (American Baptist). His articles have appeared in such publications as The Journal for the Study of the Old Testament, New Testament Studies, Novum Testamentum, and Vigilae Christianae. His other books include The Beauty Behind the Mask; The Books of The Bible (contributing editor), and After Chapters and Verses .